You're talking to someone, the phone rings, they turn around and they have a long conversation with the other person on the phone while you're just standing there? How many of you have experienced being excluded from small talk? How about someone passing you in the corridor of the office without speaking or saying �Hello� to you? Have you ever had the experience of someone taking credit for your work? How about someone constantly mispronouncing your name and not making any effort to get it right? Or someone calling you a nickname without your permission? All these are examples of what is known as micro-inequities. Micro-inequities is a term defined by Mary Rowe in the 1970s. They are defined as those subtle and disrespectful behaviours that exclude others. Sometimes they're very difficult to recognise for both the person doing it and for the person receiving it. When you commit a micro-inequity you may only do one at a time and it may not have a big impact, but it is easy to imagine how over a period of time these individual behaviours can add up and have a significant impact. It's like a drop of rain � if a drop of water hits you it probably won�t make a difference, but if drops of water hit you constantly it is certainly going to get you wet! The key issue here is how can each of us be more consciously aware about our behaviour and its impact on others? One way to address this question is to understand the idea of micro-affirmations. Micro-Affirmations are the opposite of micro-inequities and again are often the small and subtle behaviours that demonstrate inclusion. One example of a micro-affirmation behaviour is inclusive verbal skills. When you're leading a group discussion, make sure that you are involving everyone. Encourage contributions from everyone in the group, especially those who are quiet. There will always extroverts and introverts; extroverts are those who always have ideas to contribute to the meetings, and it's easy if you are not being conscious to actually exclude the introverts. You may need to specifically ask the introverts for their ideas and input. A second example is using non-verbal skills such as eye contact, smiling and nodding of the head. Acknowledge people when they speak up and say something, or make a contribution to the team. These micro-affirmations will lead to a greater sense of inclusion for all. In today's world of social media, it's really tempting when you're talking to someone to answer your phone or send a text. I'm not saying that you can�t ever do that, but I would challenge you to try to be conscious of what you are doing and its impact on others. It is not difficult to ask for permission to put a conversation on hold while you answer a phone call. Alternatively, have the phone on silent mode and focus and be present in that conversation. Newsletter Reader Question: I have been running my own business now for almost 8 years. My business has recently reached a financial position where I would like to explore options around pro-bono or charity work to give more back to my local community. Do you have any advice on finding a company or cause to support? One of the organisations that I do some pro-bono work for is the Foundation of Young Australians; a foundation that is geared towards Australians aged between 18 years and 25 years. As an organisation, they are about backing the next generation of young people to create a better future for themselves and the communities they live in. Recently, I spoke at one of their conferences and one of the things I really love about working with the Foundation is that these young people are so enthusiastic. They are highly energetic, positive and have an inspiring view of the world and what is possible. The point that I want to make is that young people are always energising. They're our dreamers and innovators, and they're constantly looking at what is going to be the future and what they could do to contribute to it. My work with the Foundation always gets me thinking about my legacy. I firmly believe that one of the things that we each must aim for in our personal or business goals is to plant seeds for the future and I appreciate that some of these seeds will be rewards that I will not see in my lifetime. So, reflect on what are your areas of interest? Where could you make a contribution? How much time do you have to devote? Perhaps engage in conversations with others and see what transpires? One thing though, I have no doubt that the pro-bono or charity work will broaden your perspective and be a useful experience at this stage of your business lifecycle. This month, we are making a slight change to our recommendation section by replacing our monthly book selection with a fantastic movie we recently saw. 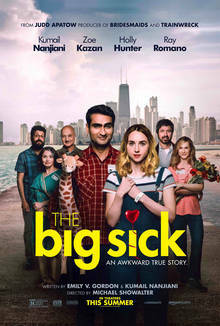 The Big Sick is based on the true story of Kumail, an Pakistani comic, who meets an American graduate student named Emily at one of his stand-up shows. As their relationship blossoms, he soon becomes worried about what his traditional Muslim parents will think of her. When Emily suddenly comes down with an illness that leaves her in a coma, Kumail finds himself developing a bond with her deeply concerned mother and father. The movie provides a great and very funny insight into the trials and tribulations of cross-cultural marriage. The story will be very relatable to many. As the world continues to shrink and these types of marriages become increasingly commonplace we expect to see a lot more fascinating content on the subject.